Etusivu › artikkeli › Paula Kyrö: Benchmarking as an Action Research Process. Paula Kyrö: Benchmarking as an Action Research Process. This manuscript approaches benchmarking as a special kind of action research by adopting Ulla Suojanen’s theoretical modification of the action research. First it compares different action research trends to the current state of benchmarking, then the features of benchmarking to its action research counterparts and finally the phases of an action research process to the phases of a benchmarking process. These comparisons lead to an evaluation of the adaptability of an action research approach in benchmarking. The evaluation indicates that an action research approach might improve the implementation as well as the theoretical foundation of the benchmarking process. Thus it is possible to use benchmarking also as a research method. Acknowledgement: I am indebted to the Jönköping International Business School for providing the excellent opportunity, databases and other facilities for carrying out this study. I was also lucky to get help from an action research expert, emerita professor Ulla Suojanen in reflecting my ideas during the study. Why adopt an action research approach? Benchmarking has established its position as a tool to improve an organisation’s performance and competitiveness by identifying and adopting the best practices from others and, recently, also by developing the best practices with others. The learning concerned with in this developmental process is one of the core themes in benchmarking literature, as Cox’s & al. identified in their comparative analyses (Ahmed and Rafiq 1998). In fact, many authors have studied the stages of the benchmarking process in order to find phases, features or a generic model for analysing and carrying out benchmarking processes. Yasin (2002), however, argues that there is a need for more theoretical developments in this field and Longbottom (2000) recommends, that a step in this direction might be to treat benchmarking as a serious research methodology. Following Longbottom’s recommendation I will address my attention to scientific methodologies, since I assume that approaching benchmarking as a research method helps to explicate the basis of benchmarking processes and at the same time offers tools for scientific research in this field. In the field of methodological choices, the developmental nature of the benchmarking process leads one to the action research traditions, which have arisen from similar challenges benchmarking is facing at the present time. Action research methodology combines practical needs for developing performance and the collective intentional learning involved in it. It could therefore be used at the same time for both practical development and scientific studies. Consequently, this study starts by delineating the interplay between science and practice in action research, and then by positioning and evaluating the targets and the current state of benchmarking in this interplay. It then proceeds by comparing the features of benchmarking to those of action research in order to see how the basis and characteristics of benchmarking relate to those of action research, i.e., what are the similarities and possible differences or specifics. Finally, the phases of an action research process will be compared to its counterpart in benchmarking. This delineates the similarities and differences between benchmarking and action research, and leads finally to an evaluation of the usability of an action research approach in benchmarking. Action research was originally established in the USA in the 1940’s. Since then it has expanded and found its various forms, especially in central and northern European countries and, e.g., in Australia. It aims to study and influence practices in social movements and work communities as an interplay between science and practice. According to Chris Argyris & al. (1985), this interplay emerges as influencing simultaneously the theoretical conceptualisation and the practical command of the phenomena it studies, while, according to Kurt Lewin, it aims to influence both the development of science and social change (Carr & Kemmis 1983). One of the fastest-growing areas in action research since the 1970’s has been education (Cohen & Manion 1989, Suojanen 2001). Suojanen (2001) identifies different trends in action research, on the one hand education- and project-oriented trends, on the other hand, research and action-oriented trends. The education- oriented trend focuses on improving learning processes and competencies, whereas project-oriented action research emphasises developing and improving the research object other than learning itself, e.g., a specific practice, activity or function such as product development, customer service, etc. In the first, learning is the object; in the latter, its role is instrumental in achieving some other goal. The difference between the research- and action-oriented trends concerns the role of scientific theories. The action-oriented is more focused on the practical application of scientific theories, i.e. applying existing scientific knowledge, while the while the research-oriented trend also aims to create new scientific knowledge. As Suojanen expresses it: “action research always requires reading the background theories as well as a systematic gathering, analysing and reporting of experiences.” The research orientation furthermore combines work experience with theoretical research. In fact, Argyris and, for example, Heller (1994) propose that the research-orientation should also be differently named: Argyris suggests “action science” and Heller “research action”. (Suojanen 2001). In order to delineate this interplay between science and practice, and further, in order to position benchmarking within this field, I show a matrix of these trends in Table 1. The arrows in the matrix indicate the interactive relationship between new scientific and practical knowledge. New scientific knowledge applied in practice creates new explicit practical knowledge that in turn develops new practices and brings up new scientific knowledge. We can even say that there are practical and scientific theories. By practical theories, Anneli Sarvimäki (1989) refers to the constructions of practical knowledge that guide intentional action, which means that people know how to behave in a practical situation, even though they cannot explicate and give reasons for the basis and, concepts and their relationship relating to this behaviour, as scientific theory requires. The matrix in Table 1 offers four alternative orientations in action research that will be compared to the targets and to the current state of benchmarking. To locate the current state of benchmarking in the action research matrix, I first focus on the interplay between the research and action orientations, and then proceed to the education and project orientations. Yasin’s findings indicate that the main focus in benchmarking is on practical knowledge for practitioners. Even though we do not know how much these practitioners might apply scientific knowledge, it is reasonable to assume that benchmarking is in its very early phase as far as both explicitly applying and creating new scientific knowledge is concerned. On the other hand, the increasing number of academic articles appearing, even though their total number is still modest, indicates that benchmarking has started to attract scientists. Thus we should perhaps add another alternative to the matrix in order to position benchmarking. This is a preliminary phase, referring to action orientation without explicitly applying scientific knowledge. This would be the dominant position for the current state of benchmarking. However, the latest findings and recommendations indicate that benchmarking has started to explicate its theoretical basis, and has identified the need to create specifically its own theoretical frameworks. The arrows in Table 2 illustrate these efforts. To proceed with comparing the education-project dimension of the matrix, we can look at the aims and targets of benchmarking. In the article “Revising the concepts and forms of benchmarking”, I identified, in the evolutionary development of benchmarking, a shift from project orientation towards process orientation, starting from the identification of process benchmarking in the 1990’s (Kyrö 2003). Also the basic philosophy behind competence benchmarking is the idea that the foundation of organizational change processes lies in a change in the actions and behaviour of individuals and teams. Karlöf & Östblom (1996), among others, use the term benchlearning, which also refers to a cultural change in efforts to become a learning organization. Organisations can improve their effectiveness by developing competences and skills and by learning how to change attitudes and practices (Kulmala 1999) The importance of process is also embedded in strategic benchmarking. Even though learning, as a part of or as the core of benchmarking, has undergone evolutionary development, towards the end of the 20th century its nature, scope and shape has changed. Previously the focus was on model learning and, as Bhutta and Huq (1999) suggest, with a problem-based orientation. The contemporary tendency is more process-oriented. It also aims to find solutions to “how“ questions, rather than focusing on “what“ questions, i.e., how things have happened and how to apply them within organisations. Most recent studies also expand learning from the individual and group level towards collective learning, aiming to influence organisation culture. Even though the term competence or learning benchmarking is still rarely mentioned, this change is evident in the works of many authors (e.g. Ball 2000, Bhutta & Huq 1999, Comm & Mathaisel 2000, Elmuti & Kathawala 1997, Jones 2000, Fernandez, McCarthy & Rakotobe-Joel 2001, Zairy & Whymark 2000a and b). This change indicates that the target of benchmarking has been extended, now covering both the projects and the process. TABLE 2 Benchmarking in the action research matrix. The position of benchmarking in the action research matrix indicates that the interplay between action and research in benchmarking is at present in a very preliminary phase and, compared to the focus of orientation, it covers both alternatives, the education and project orientations. In order to meet the basic requirements of action research there is a need to focus both on applying explicitly and on creating scientific knowledge as an interactive process. On the other hand, the matrix seems to clearly define the direction and needs for further developments. Thus the action research approach seems promising in advancing our understanding of the benchmarking process as an interplay between scientific and practical knowledge. In order to follow up this conclusion, I next compare the basis and features of benchmarking to its action research counterparts. The basis for action research is often indicated as originating from the critical paradigm first developed by the Frankfurt School. The Frankfurt School emphasises, that phenomena should not be taken for granted, but rather reflectively questioned (Anttila 2001). It is also called emancipatory, because it emphasises the development of a person’s and group’s self-consciousness and meaning. Even though there is no single definition for action research, the influence of critical theory is apparent. For example, Suojanen (2001) delineates the essential features of action research through its two central contributors Chris Argyris and S. Kemmis, who both connect critical thinking and emancipation to the change process. For Argyris, action research tries to find solutions to the concrete functional problems of organisations by questioning the existing status quo and by aiming to change the behaviour and thought structures of participants (Argyris & al. 1985). According to Kemmis, action research is emancipatory and critical, aiming to develop action and influence problematic practices as a social and participatory process that also involves the researchers themselves – either as individuals or as a group (Kemmis 1995). Jürgen Habermas, a second-generation representative of the Frankfurt school, developed the cognitive interests theory. This theory has contributed essentially to the development of action research. It divides cognitive interests into three categories, technical, practical and critical. All knowledge relates to some interest and motivates its own kind of research (Habermas 1974). These categories are often used for describing different research paradigms and for understanding what is meant by reflection (Habermas 1974, Kemmis 1985, MacIsaac 2000, Suojanen 1999). Furthermore, Suojanen also differentiates action research methods according to these levels of reflection. I have combined some essential features of these three purposes in Table 3 by adopting and modifying Suojanen’s frameworks (Suojanen 1999, 2001). A technical knowledge interest searches information for the purpose of explaining and controlling the phenomena in natural and other environments, with the aim of making predictions. It leans on the empirical-analytical scientific methodology. Reality is dualistic and reasoning is deductive. Participants are objects of the study, or, as Kemmis (1994) has pointed out, they are “them”. Technical level research does not question basic structures. The focus is on “what“ questions. The researcher is an observer and an outside expert. Technical reflection examines the action level. Issues are not questioned: they are accepted as such. A practical, interpretative knowledge interest aims at understanding man in his environment. It relates to the hermeneutic-interpretative scientific tradition, focusing on inductive reasoning. Practical reflection examines issues as a part of a larger context. It evaluates the nature of experiences and considers reasons for choices. It does not, however, question the basic structures of action. The “you” form describes the interrelations of a group (Kemmis 1994). Reflection aims to get answers to “why“ questions. The researcher might participate, but not influence the processes or the outcomes. Empowerment, that liberates participants from old practices and ways of behaving (Suojanen 1999). The term empowerment can be derived from the verbs to enable, to allow, or to permit. For Vogt and Murrel (1990), empowering is an act of building, developing, and increasing power through cooperation, sharing, and working together. For Wilson (1996), it also means making a commitment to common goals, taking risks and demonstrating initiative and creativity. Next, I use this framework in order to compare the features and current state of benchmarking to action research. This comparison follows the issues in Table 3. The shadowed cells in Table 4 indicate the result of this comparison. Consequently, I start with comparing the aim of benchmarking and the nature of learning embedded in it to those of action research. Benchmarking aims to improve an organisation’s performance and competitiveness by learning from and/or with others towards the best practices. Even though definitions vary between scholars, the aspects of evaluation and improvement by learning from others are embedded in the definitions regardless of the definer (Kyrö 2003). Thus the basic aim of benchmarking is similar to that of action research. However, empowerment is explicitly engaged only in the latest forms of benchmarking, i.e., in competence or learning benchmarking. The specifics of benchmarking relate to best practices. The starting point of benchmarking is either to learn from others’ outstanding performances, or to create them with others. The need to create new best practices rather than copying existing ones has been emphasised, e.g., by Longbottom (2000) and, Davis (1998), as well as by Hammer and Champy (1993). Thus benchmarking focuses at the same time on the outside environment and on internal practices. This interplay is also actually embedded in the critical reflection of action research as Suojanen defines it. However, it is not as clearly stated as in benchmarking. In action research, any change that improves practices within an organisation might be satisfactory, regardless of its excellency compared to those possibilities offered by the outside actors and environment. Hence, we can conclude that both, benchmarking and action research aim to improve practices, but benchmarking might consider adopting learning empowerment from action research, while action research might ponder what benchmarking can offer, as far as outside possibilities for learning from and with others are concerned. Thus similarities are evident, but benchmarking also has its specifics. The conclusion from positioning benchmarking within action research trends was, that benchmarking has started to look for its scientific basis and that it has proceeded from practice towards theorising. This manifests that the theory-practice relationship follows an inductive reasoning and interpretative approach, developing theories from practical perceptions, combining them, looking for models and finally wondering if they could lead to a theory. On the other hand, Yasin considered that there is a lack of a unifying theory for benchmarking. Looking for a unifying theory easily leads to positivism, dualism and deductive reasoning. Finally, Ahmed and Rafiq argue for diverse, integrated frameworks. The use of diverse models and further theories for the research processes is typical of critical action research, for which reason it is claimed that action research is actually rather an approach than a method (e.g. Suojanen 2001). This supports the idea that the employment of different frameworks in order to make use of an action research method is possible. The diversity can thus be connected to a single method. In conclusion, one can say that benchmarking is looking for its own paradigm, not only for its own theory or theories, and so the ideas relating to the interplay between science and practice seem to vary, perhaps indicating that diversity will be the future direction. However, if we evaluate the dominant trend in benchmarking, then this is one that focuses more on the interpretative than the positivistic or critical paradigm, even though in the transition benchmarking is facing at the moment, all directions are possible in the future. When it comes to the researcher’s role and the researcher-participant relationship in the process, benchmarking has typically developed without the researcher’s intervention as a practical development process, as Yasin’s findings indicate. The perspective of employees as researchers, has not been reported. This possibility has not perhaps been realised in benchmarking. It would bring together practice and science in the same processes, genuinely manifesting the interplay between them. Thus the position of the researcher in benchmarking remains rather as an outside observer or as a participant who does not influence the process. Finally, when it comes to the level of reflection, a comparison of benchmarking with the various action research trends indicated that the “how“ question has started to attract scientists. Recent articles ponder how the processes take place and how they can be either adapted or created. Articles dealing with “why“ questions, that lead to a liberation from old modes of thinking, are still rare. In order to thoroughly evaluate whether there are more signals of this kind of effort, we would require a larger analysis of practical references. In the light of academic writings, the current state is concerned more with “what“ and “how“ questions. To summarise the comparison of benchmarking features with its counterparts in action research, this general analysis indicates that its aims are similar, but that the state is technical or practical, rather than critical. Furthermore, the aim of benchmarking has specifics that relate to the concept of “best practice”. Thus it might be regarded as a special kind of action research. In the future, the essential question concerns the direction to be taken: towards a positivistic, interpretative-hermeneutic paradigm, or more clearly towards a critical paradigm, or perhaps towards different paradigms for different purposes. However, it could be argued that, even though the paradigm is one of the three alternatives and accordingly also one form of the action research method, the level of reflection should always reach the critical level in order to understand the “why“ questions and thus allow an explicit, intentional choice between these paradigms. These findings support the previous conclusions. Again, it is possible to conclude, that this comparison encourages exploitation of the action research approach in advancing understanding of the benchmarking process. In order to follow this conclusion further, I next elucidate the various phases of the action research process and then compare them to their counterparts in benchmarking. Action research is a cyclic process, starting with the recognition of the problem, then planning the action, proceeding to carrying this out and finally evaluating the results obtained. ( Suojanen 2001). According to Kemmis (1995), this process consists of four phases: planning, action, observation and reflection. Suojanen (2001) adopts Kemmis’s ideas and further develops them. Her more specific model has been used in teacher education in Finland within the movement “Teachers as educators” (see Figure 1). The model starts with analysing the actual situation and visioning the course of action. This is followed by plan, action, observation and reflection. Reflection leads to a revised plan followed by a new action research circle. However, even thought, in action research, preliminary analysis of the results is carried out throughout the research process, and the data received during the study (real-time reflection) already affects the action phase, the final reflection (retroactive and proactive reflection) is always necessary (Suojanen 2001). This offers tools for the next cycle, starting with a revised plan. The validity of action research is evaluated according to this spiral of planning-action-observation-reflection, which distinguishes it as a method from both the empirical-analytical and interpretative research approaches (Carr & Kemmis 1983, Kemmis 1995). Since action research concerns the interplay between theory and practice, this aspect should also be evaluated. Usually the starting point for action research is a practical, problematic or unsatisfying, situation in a work or other social environment. The purpose of the preliminary phase is to define the current situation, with the objective of visioning and planning the phases of the action research. The preliminary plan should be flexible enough to allow changes during the study when needed. Once the preliminary research theme has been clarified, the participants are chosen. In critical action research, this also involves a value debate on the most essential objectives, in order to commit members to the vision and goals. Developing an activity or a work community requires a questioning of the old practices. This demands change, both at the individual as well as at the community level. Empowerment, i.e., awareness of one’s own influence and an inner feeling of power, is important for this. There are several different methods for charting the start-up situation. This preliminary phase also serves as the first reflection situation. In this phase it is important that participants familiarise themselves with the theoretical frame of reference of the study. Finding out about the history of the developed activity might also help understanding the value foundation or societal conditions influencing the present practice. For example, history is one of the core aspects of Yrjö Engeström’s (1987) theory on developmental work research. In these decisions, the research perspective should be engaged, too, leading often to conceptual reflection (Mezirow 1981). The planning phase concerns a more accurate action plan. It requires a reconsidering of the theoretical starting points, a deepening of the self-understanding of the thought and action models and a specification of the physical and mental resources, as well as a division of responsibilities among the participants. The action plan also specifies the objectives of the study. In order to facilitate the research and the evaluation of the results and the reliability, the observation and reflection methods should also be planned in advance, since any activity that is reflected is self-evidently not research, even though it might improve practices. The action stage adheres to the objectives and the designed plan, as far as is possible. The purpose of the action is to find new solutions. One of its most important elements is co-operation. However, in order to be able to change the plan during the action if needed, constant real-time reflection is required. Planned observation is the phase that most clearly distinguishes action research from practical work. It is concerned with how to gather and analyse the data during the process for reflection. Even though interpretation and reflection takes place throughout the process, there is always the final, retroactive reflection at the end of the process. When all the participants are involved in designing the observation phase, it is possible to consider the critical stages of the process and to make sure that they are carefully documented. For data gathering, different methods can be used, e.g., diaries, portfolios, questionnaires, virtual group environments and constantly up-dated chat-facilities, recordings, interviews, problem and concept maps, etc. Even though action research includes constant, real-time reflection, it always includes, too, final retro- and proactive reflection. Reflection is a means of finding out how the action research has succeeded in developing both the studied object and the process, i.e., the learning competencies of the individual participants, group and organisation. Reflection leads to a revised plan for the next cycle. Final reflection is essential when evaluating the quality of an action research project. At the technical level, the reflection concentrates on describing activity, and evaluating models and objectives that are often given from outside the group. Practical level reflection focuses on the experiences and the basis for choices. Critical level reflection also considers the values and, ways of working and thinking, and, at best, gives an organisation’s collective memory, explicit models for coping with change processes, i.e., models of how to learn. The phases of benchmarking have been one of the key factors in benchmarking literature. Several authors have analysed it and suggested that there is actually a generic outline of these phases. I have chosen for comparison some of the latest studies, that either cover an extensive amount of literature, or clarify some essential aspects demonstrating both the similarities and specifics of benchmarking. The studies chosen aim to represent the current situation and a cross-section of the phases of benchmarking. Studies in the first category are: Longbottom’s study of 2000 with a literature review of 460 papers, Fernandez, McCarthy and Rakotobe-Joel’s study of 2001 analysing six different models, Zairi’s study of 1996 based on fourteen different models, and Kulmala’s dissertation of 1999, which focused on process benchmarking with three models. In the latter category are Büyüközkan and Maire’s study of 1998 adopting Balm’s categories, and Bhutta and Huq’s study of 1999 using Camp’s model. Since the models these authors analysed are partly overlapping, their results validate each other. A summary of the studies is shown in Table 5 and only conclusions presented here. It is easy to identify the resemblance between the phases of action research and those of benchmarking. This resemblance concerns both the phases per se and their content. As benchmarking, so action research too contains planning, analysis, action and evaluation. However there are also differences that relate on the one hand to such issues as the cyclical nature of action research, reflection and the explicit use of scientific process theories, on the other hand to the attention addressed to each phase. The cyclical nature of action research is explicated in Balm’s model and, adopted, too, in Bhutta and Huq’s (1999) analyses with the title of a benchmarking wheel; it is additionally adopted by Fernandez, McCarthy and Rakotobe-Joel (2001). The current tendency to view benchmarking as a continuous development process rather than a problem-solving project also supports the adoption of the cyclical approach (e.g. Ahmed & Rafiq 1998). The specifics of the benchmarking process concern, however, these cycles, since it could be claimed that actually all benchmarking processes contain two cycles, as Suojanen’s advanced spiral model assumes. The outcome of the first cycle concerns the choosing and evaluation of the best practices, while the outcome of the second cycle is involved with the change/implementation/adaptation of the best practices. The latter cannot be done without the former. The focus, however, in benchmarking is rather on the first than on the second cycle. The actual change in practices is less focused on, or is passed over partly. This is delineated in Table 5, which differentiates between these two cycles. Consequently, the observation and reflection phases also receive less attention, at a more general level, than they do in action research. The planning phase comprises both the preliminary and the actual planning, with one exception, i.e., Balm’s model, that makes a difference between self-analyses and the phase named pre-benchmarking. Action, observation and reflection, as well as the phase of the revised plan starting the next cycle, are either dealt with as one phase (Longbottom’s, Büyüközkan and Maire, Kulmala) or as two phases (Fernandez, McCarthy and Rakotobe-Joel, Zairi). The next cycle, that concerns applying the outcome of the first cycle, contains either one (Zairi, Kulmala) or two phases (Longbottom’s, Büyüközkan and Maire, Fernandez, McCarthy and Rakotobe-Joel). Analyses of the different contributors reveal some similarities with the issues in Suojanen’s preliminary-plan phase. All of them emphasize in their first phase a clarification of the actual situation. Longbottom calls it “internal investigation”, Büyüközkan and Maire’s self-analysis contains defining the activities and customers. Fernandez, McCarthy and Rakotobe-Joel’s, Zairi’s and Kulmala’s analyses provides similar findings. Gathering the team is an essential issue in many of these models, too. The issue not focused upon in these models is the theoretical frame of reference. Finally, the meaning of evolution, e.g., history, is explicitly suggested adding value in Fernandez, McCarthy and Rakotobe-Joel’s article. They adopt for it a cladistics classification method. Though similar, the issues of the actual planning are lacking when it comes to theoretical frameworks and the planning of both the observation and the reflection. The measurement of performance and the data or information-collecting plan are often substitutes for the plans of observation and reflection. This refers to a technical rather than a practical or critical level of aims and reflection. Since, according to Suojanen, planned observation most clearly distinguishes action research from practical work and also provides the basis for reflection, these shortcomings seem to distinguish benchmarking from scientifically-argued and conducted action research. Thus it can be concluded that there are similarities, but also differences, in both the phases per se and their content within and between different models, as well as between benchmarking and action research. Since, however, the phases of different contributors can be logically positioned in the action research model, it could be argued that action research offers a general scientific approach for conducting a benchmarking process, and also that Suojanen’s advanced cyclical spiral model offers basis for a benchmarking-specific two-cycle action research model. These findings also support the conclusions drawn from positioning benchmarking within the various action research trends, suggesting that benchmarking is in a very early phase when it comes to the interplay between scientific theories and practice. It also follows those conclusions made from comparison of the features of benchmarking to those of action research, namely, that even though the aim of benchmarking leads to the critical paradigm, its current state reflects rather the empiricist-analytical and interpretative-hermeneutic paradigms, and consequently technical and practical reflection, rather, than the critical paradigm and reflection. 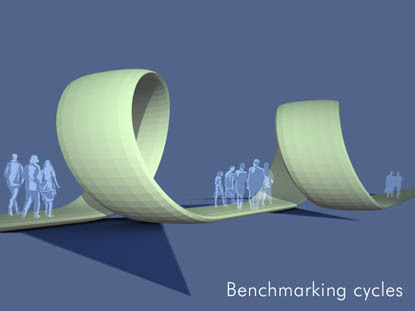 Finally, approaching the benchmarking process as a two-cycle spiral, where the actual data collection phase is regarded as an action of the first cycle, follows the very nature of the benchmarking process, and at the same time is generic enough to be adopted for different forms of benchmarking. Second, in successful processes the spiral is assumed to lead to further improvements in the benchmarker’s practices, thus leading to new circles. The explicit, intentional reflection phase embedded in each cycle facilitates the next cycle and increases its effectiveness, since it is assumed to empower participants and to improve their competencies in learning how to learn at both the individual and collective levels. Thus it might be claimed that applying the action research approach might improve the quality of a benchmarking process. On the other hand, it carries the debate on the benchmarking process forward to a more generic level, and thus it might be argued that it advances the scientific modelling of the benchmarking process. The benchmarking process had indeed an apparent resemblance with action research, though there were differences and specifics as well. A two-cycle spiral, where the actual data collection phase is regarded as an action of the first cycle and the implementation involves the next cycle, follows the very nature of the benchmarking process, and at the same time is generic enough to be adopted for different processes. Thus benchmarking might be regarded as a special kind of action research. Shortcomings were found, however, in the phases of preliminary planning, observation, reflection and the use of theoretical frameworks, all of which are essential for distinguishing a scientifically-conducted action research process from practical work. Thus adopting cyclical action research method might improve the quality of the benchmarking process. The results of these three analyses support each other and lead to the same conclusion. This encourages one to adopt action research, and especially Suojanen’s model of it, for studying and conducting the benchmarking process. Thus it offers us a scientific research method, not only an approach or a strategy for studying human behaviour and the interaction between scientific and practical knowledge. This analysis should therefore be regarded as a very preliminary conditional endeavour to theorise on the benchmarking process. It has not found a unifying theory, as Yasin called for, but rather looked at the benchmarking process from a certain theoretical viewpoint. This effort has indicated, however, that it is possible to identify the specifics of benchmarking within the field of action research, thus distinguishing it from neighbouring phenomena, which is the first phase towards benchmarking specific theories. Anttila, P. (2001) “The entity of research process”. Argyris, C., Putman, R, & McLain Smith, D. (1985). Action Science. Concepts, Methods and Skills for Research and Intervention. San Francisco: Jossey-Bass Publishers. Ball, A. (2000) “Benchmarking in local government under a central government agenda”, Benchmarking: An International Journal, Vol 7 No 1, pp. 20-34. Büyüközkan, G. and Maire, J-L. (1998) “Benchmarking process formalization and a case study”, Benchmarking for Quality, management & technology, Vol 5 No 2, pp. 101-125. Carpinetti, L.C.R. and de Melo, A.M. (2002) “What to benchmark? A systematic approach and cases”, Benchmarking: An International Journal, Vol 9 No 3, pp. 244-255. Carr, W. & Kemmis, S. (1983). Becoming critical: Knowing through action research. Victoria: Deakin University. Cohen, L. & Manion, L. (1980). Research methods in education. London: Croom Helm. Comm, C.L. and Mathaisel, D.F.X. (2000) “A paradigm for benchmarking lean initiatives for quality improvement”, Benchmarking: An International Journal, Vol 7 No 2, pp. 118-127. Davis, P. (1998) “The burgeoning of benchmarking in British local government”, Benchmarking for quality management & technology, Vol 5 No 4, pp. 260-270. Dewey, J. (1951). Experience and education. 13th edition. New York. The MacMillan Company. Elmuti, D. and Kathawala, Y. (1997) “An overview of benchmarking process: a tool for continuous improvement and competitive advantage”, Benchmarking for Quality, Management and Technology, Vol 4 No 4, pp. 229-243. Engeström, Y. 1987. Learning by expanding: An activity-theoretical approach to developmental research. Helsinki: Orienta-Konsultit. Fernandez, P., McCarthy, P.F. and Rakotobe-Joel, T. (2001) “An evolutionary approach to benchmarking”, Benchmarking: An International Journal, Vol 8 No 4, pp. 281-305. Habermas, J. (1974). Theory and Practice. London:Heinemann. Hammer, M. and Champhy, J. (1993), Re-engineering the corporation: A manifesto for business revolution, Brealey, London. Heller, F. (1994). Some Thoughts on the Relation between Research and Action. In T. Kauppinen & M. Lahtonen (ed.) National Action Research Programmes in 1990s. Labour Policy Studies 86. Ministry of Labour. Helsinki: Hakapaino Oy. p. 71-83. James, W. (1913). Pragmatismi. Helsinki. Otava. Jones, R. (1999) “The role of benchmarking within the cultural reform journey of an award-winning Australian local authority”, Benchmarking: An International Journal, Vol 6 No 4, pp. 338-349. Karlöf, B. and Östblom, S. (1995), Benchmarking. Tuottavuudella ja laadulla mestariksi, Gummerus, Finland. Kemmis, S. (1985). Action Research and the Politics of Reflection. In D. Boud, R.
Keogh & D. Walker (ed.) Reflection: Turning Experience into Learning. London: Kogan Page, 139-163. Kemmis, S. (1994). Emancipatory Aspirations in a Postmodern Era. A Keynote address in the conference Curriculum Changes in Hong Kong: The Needs of the New Era. The Chinese University of Hong Kong, April 29-30, 1994. Kemmis, S. (1995). Action Research and Communative Action. Paper presented at the research seminar on Action Research – Emancipatory Aspirations in a Postmodern era held in Tampere August 7-8.1995. Kulmala, J. (1999), Benchmarkingin ammatillisen aikuiskoulutuskeskuksen toiminnan kehittämisen välineenä. Acta Universitatis Tamperensis 663. Tampere. Longbottom, D. (2000), “Benchmarking in the UK: an empirical study of practitioners and academics”, Benchmarking: An International Journal, Vol 7 No 2, pp. 98-117. Mezirov, J. (1981). A Critical Theory of Adult Learning and Education. Adult Education 32 (1), 3-24. Prado, J.C.P. (2001) “Benchmarking for the development of quality assurance systems”, Benchmarking: An International Journal, Vol 8 No 1, pp. 62-69. Razmi, J., Zairi, M., Jarrar Y.F. (2000) “The application of graphical techniques in evaluating benchmarking partners.” Benchmarking: An International Journal, Vol 7 No 4, pp. 304-314. Sarvimäki, A. (1988). Knowledge in Interactive Practice Disciplines: An analysis of knowledge in education and health care. Helsinki: Department of Education University of Helsinki. research Bulletin 68. Suojanen, U. (1999). Action Research – A Strategy for Empowerment. In K. Turkki (ed.) New Approaches to the Study of Everyday Life. Part II. Proceedings of the International Household & Family Research Conference, May 31-June 3, 1998, Helsinki, Finland. Publications 4. Department of Home Economics and Craft Science, 81-88. Suojanen, U. (2001). Action research. Wilson, P. (1996). Empowering the Self-Directed Team. Great Britain: Gower Publishing Limited. Watson, G.H., 1993: Strategic Benchmarking: How to Rate your Company’s Performance against the World’s Best, John Wiley and Sons Inc, New York, NY. Vogt, F. & Murrell, K. (1990). Empowerment in Organizations. How to Spark Exceptional Performance. San Diego: Pfeiffer and Co.
Yasin, M.M. (2002) “The theory and practice of benchmarking: then and now”, Benchmarking: An International Journal, Vol 9 No 3, pp. 217-243. Zairi, M. (1996) “A review of key publications on benchmarking: Part II”. Benchmarking: An International Journal, Vol 3 No 1, pp. 45-49. Zairi, M. and Whymark, J. (2000a) “The transfer of best practices: how to build a culture of benchmarking and continuous learning- part 1”, Benchmarking: An International Journal, Vol 7 No 1, pp. 62-78. Zairi, M. and Whymark, J. (2000b) “The transfer of best practices: how to build a culture of benchmarking and continuous learning- part 2”, Benchmarking: An International Journal, Vol 7 No 2, pp. 146-167.